On page 246 of Nicola’s excellent book, Write to be Published, (you have all got a copy, haven’t you? ), she makes a very flattering reference to me being a rare case of someone who’d managed to get a book deal after posting instalments of my book online. I was particularly pleased to be used as an example because I’m a long-time reader of this excellent blog, [NM bows] and I thought it might be nice to repay the compliment by telling you how it actually happened. Towards the end of 2009 I had a problem. I was around 10,000 words into a high-concept novel (Mrs Darcy versus the Aliens) that I’d been writing on and off for two years and I had a sickening feeling that if I ever did manage to motivate myself to finish the thing it would never get published. The main problem was that when I’d originally dreamt the book up, back in 2007, the concept of a sequel to Pride and Prejudice with added aliens was pretty radical. However, after that zombie book (I’m sorry, but I can’t bring myself to name it) [NM – you’ll be glad to know that I actually haven’t a clue what you’re talking about] came out in early 2009, what I was writing now looked like a wannabe bandwagon-jumper. You may ask why I’d only written 10,000 words in those two years. First, I had very little idea how to write a novel and took ages to get going. More importantly, the arrival of TZB [NM – The Zombie Butler? Birdbath? Bathysphere? Bob?] had dampened my enthusiasm to the point where it was lying, sodden, in the gutter of my dreams. Worse, the word on the street was that publishers were, several months on from TZB, no longer interested in mash-ups. The bandwagon had left town. The trouble was, I still liked those 10,000 words. More importantly, so did my writer friends, who kept badgering me to write some more. Time to take radical action. Why not serialize the thing? That way I could see if it really would find an audience. Not only would that give me a reason to continue writing it, but it might just provide a publisher with enough evidence to take it on. I decided on 100 bi-weekly blog posts, plus prologue and epilogue, which gave me two spare days in case of disaster if I ran it over a year. My 10K words gave me two and a half months in the can, so I could at least run it for that long to see if it was going to fly. Unbelievably, it worked, and in November 2010 I signed a contract with Proxima Books, with Salt Publishing (Proxima’s parent) committing to it being a lead title for 2011! However, before you all leap to the conclusion that the answer to all your publishing prayers is to stick your WIP online, I offer a few words of caution, if only because Nicola will shout at me otherwise. [NM – I was just getting ready to do that.] Quite right too: generally speaking, this isn’t a remotely advisable thing to do. So why did it work for me? Here are some contributory factors: none sufficient, but all necessary. 1) Writing: OK, I’ll put aside false modesty for a moment and claim that it was actually pretty well written. 2) Structure: the story broke down well into easily-digestible 600-700 word chunks, with plenty of gags in each one and a punchline or cliffhanger at the end. This suited my way of writing – by nature I’m a short story writer and this was the first time I’d ever coaxed a narrative beyond 3000 words. 3) Marketing: I already had a reasonable social networking footprint on Twitter, Facebook, my own blog and various writing forums and I used these aggressively (although I hope not annoyingly) to promote the serialisation. I also spent a long time doing the rounds of other blogs, pestering them to feature it. I also produced a couple of very silly YouTube promo videos that (ahem) proved to be a bit of a talking point. It was a question of trying anything I could think of, and it was a LOT of work. So would it have found a publisher if I hadn’t done this? No idea. Would I have finished it? That’s a more interesting question, and I think the answer is: unlikely. In the end, the most important thing about serialising my first novel was that complete strangers ended up wanting me to keep writing it. So would I do it again? Almost certainly not. But never say never, eh? Oh, and I almost forgot to mention. It’s out now. Do get yourselves a copy. I think you might enjoy it. Sorry, I think Nicola has disappeared. I'm sure she'll be back. I love the concept, Jonathan. It was interesting to read your less usual route to publication. But, my gosh, Mrs Darcy has a difficult life, what with the running of Pemberley, and the gay, social whirl. Surely, it is too much for her to contend with? Everything getting put out of joint by the arrival of aliens must be beyond even her capabilities. Thank you! It is indeed most vexatious for poor Mrs D. But she copes well, even when aliens make an appearance in the middle of the Pemberley Summer Ball. *Whispers* 'Pride & Prejudice & Zombies?' I must confess I did enoy that book! 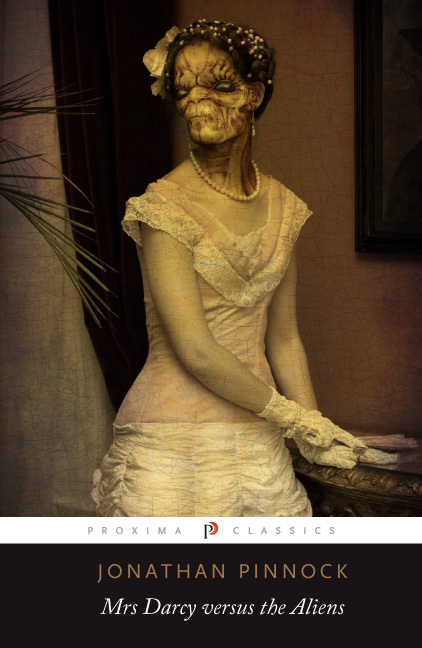 If there was one thing lacking in Jane Austen's writing it was a lack of Zombies. However, I think the idea of a sequal, rather than a re-working of the original is even more interesting - and gives you more freedom. I've always wondered about Lizzy & Mr D's life after they got married anyway - so throw in some aliens and you just made my day! You're on my 'to buy' list Jonathan, glad everything worked out well in the end! I've only recently heard of this book (where have I been?) and when I first saw the title, I honestly didn't think it'd be my type of thing. However, having looked at the extracts on the website, have to say I'm loving what I've read so far. Congratulations on publication! I think your story demonstrates if something is well-written and original enough, there are markets out there. This is weird!! I just bought the book this morning while browsing in WHS & I hardly EVER browse in WHS!!! Walked in & it was the first book that caught my eye (thankfully it gave it back so I could have a proper read!) I shall now move it to the top of my 'to read' pile! Thanks for sharing your route to publication, very interesting! Joy, How wonderful! I'm so pleased it caught your eye - really glad to know it's got shelf appeal :) Hope you enjoy it! I don't like zombies but am quite parital to aliens so perhaps I should give your book a bash. Or even read it. Thanks for telling us of your unconventional path to publication. I definitely think you should, womagwriter :) But I guess I'm slightly biased.